A shih-poo is a mix between a shih-tzu and a poodle. These dogs are very intelligent so training is easy. 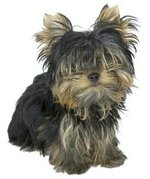 This particular breed of dog requires a lot of attention from its owners because it does not do well on its own. A shih-poo can become depressed easily and become destructive if left alone too much. Shih-poos are well tempered and loyal, so they make great watchdogs. If a shih-poo is well taken care of, it can live up to 17 years. Housebreak your shih-poo. Set a schedule to take your shih-poo outside to go to the bathroom. Take your dog outside and praise it each time it goes potty. Give the dog a treat when it's done to let it know that it did a good job. Remember to be repetitive so the dog will learn. 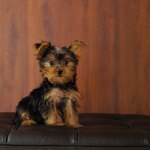 Use the same repetitive method when training your dog to behave in the house. Do not scold your shih-poo if it has an accident or does something it's not suppose to do. Stay calm and show your shih-poo how to do it correctly and it will pick up on it. Brush your dog's fur often to keep it from getting tangled. Clip the toenails to keep them short. Squirt a few drops of a pet ear cleaning solution into the dog's ear. Rub out the debris carefully with a cotton swab. Wipe the excess debris from the outer ears with a paper towel. Bathe your shih-poo when it becomes dirty or has a flea outbreak. Use a dog tear stain remover with a soft cloth to clean around its eyes at least once a week. Play with your shih-poo often because this is how it gets most of its exercise. Keep your shih-poo around people as much as possible because it is a very social dog. Buy plenty of toys for your dog to play with. Walk your dog using a leash for about a half hour each day. Feed your dog dry dog food three times a day and provide plenty of fresh water. Read the dog food package to know how much to feed your dog. Feeding your dog depends on its age and weight. Try feeding your dog 1/4 cup each feeding at first. Adjust the amount if it is not finishing the food between feedings. Pay attention to your dog's eating and drinking habits. Shih-poos can become picky eaters. Hand feed your shih-poo if it refuse to eat from its bowl. Take your dog to the vet at least once a year to have a physical, and get it re-vaccinated and dewormed. Shih-poos are known to have problems with hips and knees because of their size. Have your vet check your dog for ear infections, spinal disc disease, anemia, heart disease and epilepsy because these issues are most common with this breed. Pay close attention to your dog's teeth and brush them with dog toothpaste and a toothbrush as much as possible to prevent tooth loss.